Reiji has a rather dark and cold personality. He usually keeps silent during his bey battles except for when he will speak to strike fear in his opponents heart. He often walks as though he&#039;s drunk, wavering and never actually walking straight and he tends to point a lot as well. Reiji also has a rather sadistic side to him, having his goal to destory a beyblade, and the beyblader&#039;s hearts during a battle. An example is when Reiji started to unleash several serpents from his beyblade and they started to attack Hyouma&#039;s Aries. Hyouma started to beg Mizuchi to stop but this did not change his mind about destroying Aries. It is also clear that when Reiji was facing Kenta that he did not understand that Beyblade was fought using the bladers feeling and heart. This caused him to go insane and then unleased his dark spin technique again which destroyed Flame Saggittario. 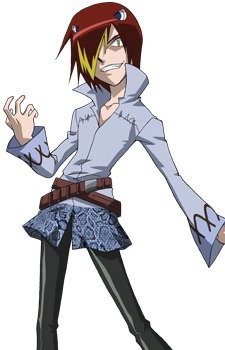 Overall Reiji is a character with a cold, super insane and sadistic personality who enjoys to destroy his opponents Beyblade without any regard for their feelings.